Following US President Barack Obama's dubious stellar performance this week at the UN General Assembly recounting a litany of lies for almost one hour before the eyes of the world, it was the turn of Turkey's leader Recep Tayyip Erdogan to insult humanity's intelligence. Like his American ally, who inverted reality by claiming that US war crimes against numerous nations were a virtuous legacy, Erdogan performed a similar spellbinding conjuring trick. In his address to the UN, the Turkish president said his military has rendered peace to the Middle East region by invading Syria last month. Can you imagine Adolf Hitler declaring to the then League of Nations that Germany had just invaded Poland to restore peace to Europe? 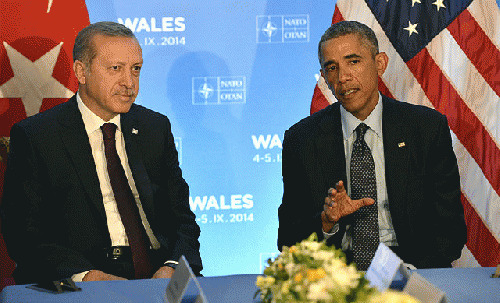 It is astounding, when you think about it, how the august international forum in New York City indulged Erdogan and Obama with such polite attention, when they are both responsible for the supreme war crime of aggression against the sovereign state of Syria? Turkish and American troops are occupying a 100-km wide swathe of northern Syria after they both launched Operation Euphrates Shield on August 24, with tanks and warplanes in support of ground forces. Syria and Russia have both expressed concern over the incursion, with Damascus denouncing it as a violation of its sovereignty and territorial integrity. American warplanes have been violating Syrian sovereignty for nearly two years. Just because Turkey and the US claim that the latest operation is aimed at fighting the ISIS terror network, that still does not confer legitimacy. Four weeks on from the US and Turkey launching the incursion into Syrian territory, Ankara says that it is expanding its occupation. Earlier this week, Erdogan said his troops would push further south into Syria to take a total area of 5,000 square kms -- about five times the area already under its present control. In Orwellian jargon, the Turkish-US forces are labelling the annexed territory as safe zones . Exactly to whom this is being made safe for is not yet clear. While in New York City, the Turkish leader urged the US to step up its military cooperation with Ankara to, as he put it, finish off Daesh [ISIS] in Syria. Erdogan is pushing Washington even harder to get onboard with the long-held Turkish objective of setting up no fly zones in the occupied northern Syrian territory. Erdogan also hinted that he expected a Clinton presidency to be more gung-ho about escalating military involvement, and in particular implementing no fly zones. Hillary Clinton has already said that she would take a more hostile line towards Syria and Russia, going as far as declaring she would deploy military force to oust President Bashar al-Assad. It is notable that Erdogan is making his appeals solely to Washington for greater military intervention to finish off Daesh in Syria. Surely, if Turkey was serious about this stated objective then it would be entreating Russia to join forces, given that Russia has shown itself to be the most effective military power against the terror groups, after it was requested to intervene by the Syrian government last year. That Erdogan wants to go it alone with the US on his supposed anti-terror mission in Syria points to an ulterior agenda. That agenda is nothing less than war on Syria. Using the pretext of fighting terrorism is a risible cover for the fact that Turkish and American military forces are illegally operating on Syrian soil. And as they expand their presence towards the northern Syrian city of Aleppo, what should become apparent is that these two NATO members are involved in an full-on invasion of Syria. Forget about ISIS or any other terror outfit that Washington and Ankara are publicly claiming to be combating. Turkish media last year exposed the Erdogan government's cross-border weapons supply to illegally armed insurgents in Syria. The notoriously porous Turk border is porous because that is part of Ankara's covert war on Syria, in league with Washington and other NATO members, Britain and France, as well as the Wahhabi terror-funding Saudi regime. Russian military surveillance footage has also proven that the Turkish authorities were colluding with terror groups in running oil-smuggling operations, until, that is, Russian aviation forces obliterated this Erdogan war racket.